We must consider the possibility that going to Mars is just as much an act of grief in denial as an act of triumph in achievement. Before the official trailer for Ridley Scott’s the Martian came out in June, a more somber teaser trailer was the talk of science fiction enthusiasts. It opens with a view of a dust storm gathering strength as it barrels mercilessly toward the humble camp of the first human beings on Mars. On screen, the landscape of the so-called “red planet” looks more like a catacomb than the cradle of a new civilization. The surface appears scorched, deprived for too long of the life-giving force of water and rendered hostile by the arrival of an alien species from the neighboring blue planet. The hasty evacuation in the midst of the storm leaves one of the team’s astronauts behind. The teaser concludes with an aerial view of the planet next to the blackness of the space in which it resides. The enormity of the storm is visible on the surface, making viewers wonder if Mars harbors not just inhospitable conditions but actual malice toward humans who dare to tread there. Seeing as Ridley Scott’s career seems to be guided by a duty to terrify humans out of space exploration forever, the horror of the scenario portrayed should be taken with a grain of salt. But as the idea of manned missions to Mars gets closer to a reality, it would be wise for those of us outside NASA and its space agency counterparts around the world to consider the ethics of sending people to Mars. Most of our conversations about Mars focus on the question of whether or not we can get humans there safely but stop short of asking if we should. We are a civilization coming to terms with the fact that we’ve set in motion the inescapable march of the oceans, which will swallow our coastlines, and a climate we cannot predict. A planet without oceans, combined with our nostalgia for the first moon landing, makes Mars uniquely appealing. Human nature compels us to explore and expand, and there is undoubtedly tremendous knowledge to gain from traveling there. The whole idea makes it easier to remember the inspiring dispatch from decades ago, “That’s one small leap for man, one giant leap for mankind.” Largely unknown to the public is another speech: an alternative that was prepared for President Nixon in case the mission went awry. It began, “Fate has ordained that the men who went to the moon to explore in peace will stay to rest in peace.” Mars might have a great deal more in store for humans than we can possibly know. And as complex, foreign organisms with a storied history of indelicate exploration in new environments, we humans might have more in store for Mars than it is prepared to handle too. Many view the safety risks of putting humans on Mars as tolerable, so long as the astronauts give informed consent to be exposed to such risks. But the disaster plan for the first moon landing illustrates how truly uninformed they might be. A memo dated two days before the Apollo 11 landing included a plan to cut off all communication with the astronauts and leave them to die if disaster struck. This callousness might perhaps be a product of the single-mindedness of the Cold War space race and would not be protocol in the 21st century, but betting on ethical behavior from any government in any time period is not an especially winning proposition. Though expectations of transparency have shifted with time, we must consider the possibility that astronauts will be exposed not just to tremendous safety risks but also to arguably cruel treatment from their home planet. Some will argue that people bound for Mars will make the journey with a full understanding of the knowable health risks, including death, and that submitting to that condition means surrendering any rights at all. But a contract that says “I understand that I might die” is different from one that says “Because I understand that I might die, I also forfeit any entitlement to anything from Earth in the event that I survive.” If astronauts do have airtight contracts with the agencies or companies sending them, they still have no way of invoking any rights guaranteed to them from a planet with no contract lawyers on it. For example, Mars One has a stated priority of offering “Unlimited access to email and other communication channels to keep in touch with friends and family back on Earth,” but its financing is predicated on the belief that there will be sustained media interest in the planet. If this proves false, there might not be a budget for sustaining unlimited communication. Cutting off email might seem benign enough until the same austerity cuts into medical and food budgets. Even assuming that whichever body oversees the mission is ultra-benevolent and well-funded, there are unknowable unknowns that even the most in-depth speculation will not cover. I spoke to Christopher P. McKay, a senior scientist at the NASA Ames Research Center, about how the limitations of our knowledge of Mars might inform our approach to sending humans there. 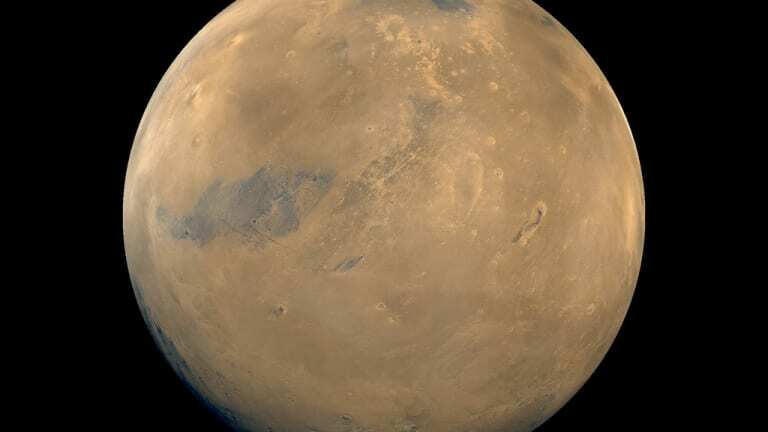 Among the biggest concerns is the relatively recent discovery that the surface of Mars contains a salt compound called perchlorate, at three to four orders of magnitude greater than in soil on Earth. “If that much perchlorate was in your backyard, it would be a Superfund site,” McKay explains, noting that it creates the need for additional de-contamination protocols on Mars to prevent bringing toxic materials into the vessels where astronauts live. Aldrin is one of many who compares the first explorers on Mars to the European pioneers in North America, but he and others omit the pioneer’s tendency to plunder frontiers to destruction. McKay said the perchlorate is a practical problem with a practical solution, but the fact that we were surprised by it should give us pause. “We thought the salt on Mars was sodium chloride, like on Earth,” he told me. He said that though it is the similarities of Mars to Earth that capture much of our interest in exploring it, being too presumptuous about those similarities risks putting both our astronauts and Mars itself in danger. In a vast and mysterious universe, a nearby planet bearing evidence of a warm, wet climate history and dried-up rivers and oceans can look more inviting than it is. Linda McDonald Glenn, an attorney and bioethicist who researches the ethical and legal aspects of exponential technologies (technologies that fundamentally change society, like the Internet or cellular technology) told me that these same geocentric views might risk harming Mars too. “We humans tend to break things down into persons or property,” she says. Though the Outer Space Treaty prevents any country on Earth from declaring ownership of another planet, it does not consider the possibility that Mars might belong to someone or something else. This possibility that there is already life on Mars, which originated independently from life on Earth, is referred to as “second Genesis.” McKay believes that if we do determine that Martian life was a result of a second Genesis, we have an obligation to help that life flourish by creating an environment where it can thrive, even if that environment means that we cannot proceed to settle Mars. But the idea that we might go to Mars and turn back around if we discover indigenous life is at odds with the one-way missions that many enthusiasts for Mars colonization advocate. 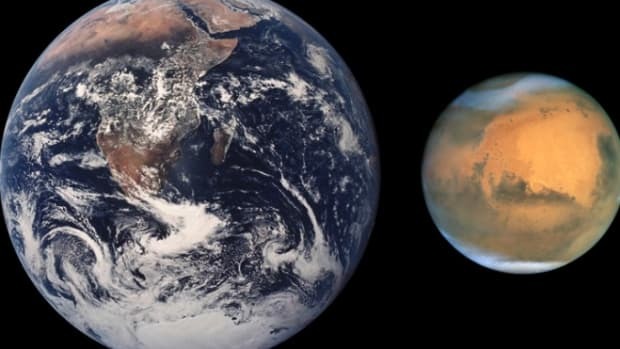 Such groups are the most likely to condone terraforming Mars for the purpose of replicating conditions on Earth by re-creating atmospheric and soil conditions. To make it possible for life to flourish there, we would need to concoct the right greenhouse gases for a hospitable atmosphere, melt the subterranean ice at the Martian poles to create bodies of water, and find a way to heat the planet. Though some of this technology remains theoretical, with sufficient investment, there is much that can be done to start making Mars more like Earth. In 2010, Buzz Aldrin of the Apollo 11 mission told Vanity Fair: “Did the Pilgrims on the Mayflower sit around Plymouth Rock waiting for a return trip? They came here to settle. And that’s what we should be doing on Mars. When you go to Mars, you need to have made the decision that you’re there permanently.” Aldrin is one of many who compares the first explorers on Mars to the European pioneers in North America, but he and others omit the pioneer’s tendency to plunder frontiers to destruction. Aerospace engineer Robert Zubrin is a vocal advocate for one-way missions, but his blueprint for colonization, the Case for Mars, acknowledges that Mars colonies might be Earth dependent for centuries before they become self-sufficient. 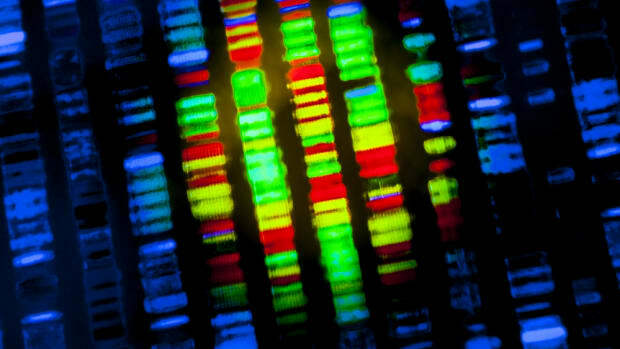 The champions of colonization make arguments that are at once compelling in their appeal to humanity’s adventurous spirit and cavalier in their disregard for ethical considerations. And though it was once the exclusive purview of space agencies to send people to space, the intentions of groups like Mars One and Elon Musk’s SpaceX are transparently focused on setting up permanent colonies. Private corporations arriving first on Mars to decide the fate of the planet might result in a libertarian utopia or a plunderous exercise in mass suicide, largely depending on your ideological commitments. Nursing any possible remaining life on Mars back to health might be a heroic act of resuscitation or a clumsy and macabre poking of a corpse. That Mars One intends to broadcast the Mars missions as reality television suggests it is at once innovative and unscrupulous, to say nothing of the fact that an MIT study of its plan predicted the crew would die horribly within months of arrival on Mars. In May SpaceX was approved by NASA to launch more missions, inching Musk’s pathological ambition closer to his goal of heading up a permanent mission to Mars. A new and well-received biography of Musk reveals him as both visionary genius and ruthless space cowboy whose ambition might blind him to the tedious work of ethics. On the back cover of the book, a blurb from author Brad Stone reads, “Should Musk bring humanity to Mars, this will be the planet’s founding document.” Ideological commitments to human exploration of the unknown compel many to believe Musk and his colleagues can and should lay the groundwork for a future on Mars. Those with more suspicious views of the impulse to colonize approach this prospect with terror. Fortunately, McKay says, in their conversations with him, groups that are intent on manning missions to Mars have been hungry for knowledge of best practices for Mars exploration. He likened these Mars trips to the time when Antarctica was opened up to tourists not beholden to the ethical guidelines of scientific agencies. But because these tourists had the trips marketed to them in a spirit of conservation and respect for the environment, these tourists probably had even more profound respect for environmental protocols. Others with whom I spoke drew up the more grim comparison to the first European settlers extracting resources at any cost and wreaking havoc. “Just like those explorers, people will bring a lot of their bad ideas with them but also have a chance to set up something new,” says Brian Green, an ethicist at Santa Clara University. “It gives people the opportunity to experiment. But we need to remember that most experiments fail.” Before heading to Mars, we would be wise to consider what a failed experiment on Mars looks like. It doesn’t require a high tolerance if we’re confident that the first explorers will treat Mars like eco-tourists treated the Antarctic terrain, but it does if we consider the possibility that they’ll take more cues from Columbus and his brutal cohort. As Mars colonization becomes more plausible, we tend to channel our fears and failures about the fate of Earth into lofty ambitions for the other planet. We must consider the possibility that going to Mars is just as much an act of grief in denial as an act of triumph in achievement. Nursing any possible remaining life on Mars back to health might be a heroic act of resuscitation or a clumsy and macabre poking of a corpse. And if it ends up being the former, we must acknowledge that we pursued that life not only for its own sake but in defiance of mortality and for fear of the blackness of the space in which it resides. 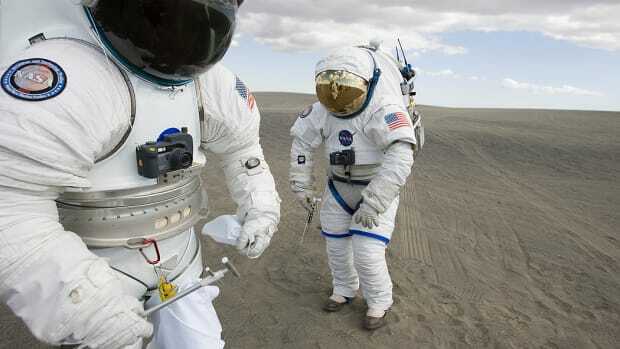 Studies show that it takes a certain kind of crazy to volunteer for a trip to Mars. 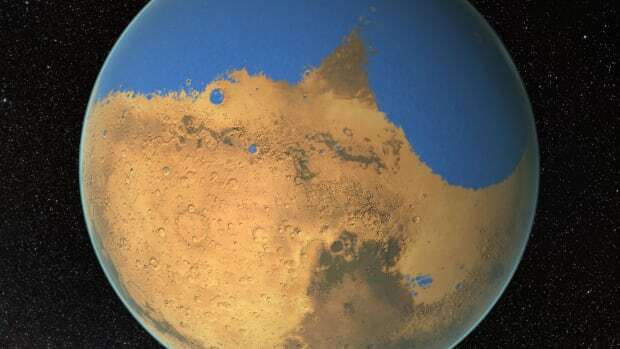 Now a cold, barren desert, Mars once had an ocean bigger than the Arctic. The preliminary science suggests Marstronauts are going to need some protection. Scientists weigh the possibility that methane gas on Mars comes from microorganisms in the soil. Could Common Earthly Organisms Thrive on Mars? 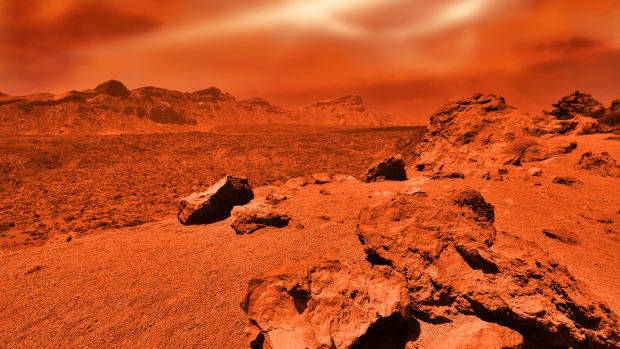 Emerging research suggests that methanogens might be able to withstand the temperature swings and low pressures of a Martian existence.